The first thing I noticed about the instrument is that despite the fact that it was new it did show a little bit of wear. There was one small dent in the bell and a few scratches on the body. Of course this is not a very big deal. Upon playing it for the first time I noticed that the C sharp key would not open. Upon closer inspection I saw that the screw holding in the key was not round but looked like it had been poorly filed on one side in order to make it fit. This was causing the key to jam. A quick trip to lathe solved this problem and now the key opens freely. It is worth noting that the clarinet in general played fairly well at this point but has a few minor problems. The next thing I noticed about the clarinet was that it had rollers on the two lowest keys. This is a nice feature that is been added recently to these clarinet but this is happiness was short-lived when I realized that the rollers didn't even move. They were too wide and got caught between the screw holding them in and the key they were attached to. I was able to fix them by filing them down and now they roll freely. Another problem that I noticed is that the rod that operates the 2nd register key has a place for two springs yet only one has been installed. While this may seem problematic the rod is already fairly stiff so another spring would do no good. The last problem that I noticed was that the left-hand D key didn't function whatsoever. Currently I am thinking of a solution to fix this. After fixing these problems with the clarinet it actually plays quite nicely. It sounds a lot more like my wooden bass clarinet than the plastic ones that I use to play on. The key work is quite sturdy and I don't feel it will come out of adjustment easily. overall is quite nice and very playable once repaired. The instrument is fairly responsive and is much better than your average plastic student clarinet. The material it is made of feels quite strong and I feel it will last a long time. If I can give you one hint of advice about buying Chinese low c bass clarinets it's to buy the cheapest one you see. Name brand will mean nothing whether it's Allora or whatever, a Chinese bass clarinet is a Chinese bass clarinet end of story. After they are set up they can play quite nicely and I plan to use mine as my main clarinet. Do not by a Chinese bass clarinet unless you have the resources to make it play otherwise you will just be met with frustration. I hope this helps out a few people. Personally,I don't advise buying a Chinese bass clarinet, if you are going to pay someone else to correct the problems. You may not be saving much money in the long run. The Allora I just worked on was not a well made instrument. Posts were loose, keys were poorly fit, soft and roughly made. The body was also a bit "rough". After some repair it played nicely, but will probably be back often with bent keys (it is a school instrument). 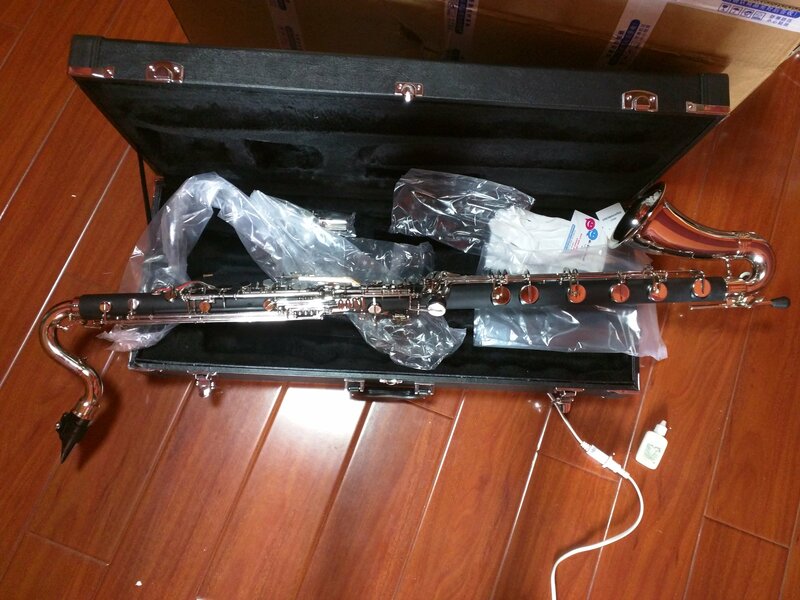 If bass clarinet is just a sometime thing, and you're as skillful and well equipped as jdbassplayer, and you're willing to handle it like a newborn baby, a Chinese bass may be OK. Otherwise not. About seven or eight (?) 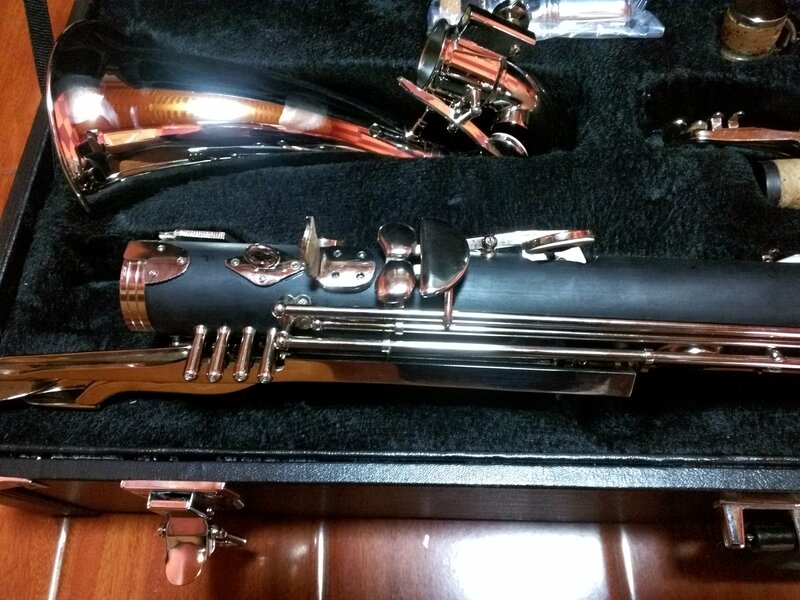 years ago when Tom Ridenour came out with his original hard-rubber low-C bass clarinet model (which is not quite as good as the current model), I tried the prototype and decided to buy it. This was basically the generic Chinese bass clarinet we're talking about here. I too was seduced by its low price and the generally adequate playing qualities. But it had a few intonation issues I couldn't completely correct, and after I heard a recording of a concert on which I played the instrument (with quite a few exposed parts) I realized I didn't like the tone quality at all. So I sold the instrument after just a month of ownership and have never regretted the decision. First impressions are not always to be trusted. Beware. After a little thinking I decided to remove the key corks from the low d key and replace them with vinyl tubing. The key is now usable but still fairly stiff. I figure that I will mostly use thumb keys so this won't be much of a problem. As for the intonation it is pretty good. I apologize for the lack of pictures as I have never had any luck with uploading pictures to this site. We have a Martinelli (Chinese made) Low C Bass Clarinet. We bought it from an online rental company after trying it out for a month. My daughter is an All State performer and we wanted to give her a reasonably priced Low C to progress into. The instrument seemed to be working well. However after the rigors of travel to the All State weekend, it has some serious issues. The problem seems to be some bent keys, missing springs and screws. We so far have not found a local repair person to fix this. They say it is a brand that they don’t service. JDBassplayer, you sound very knowledgeable and capable in repairs. Would you be available to repair this instrument. We would ask that you bring the instrument up to its full potential as you seem to have done for your own. We live in Des Moines Iowa and can ship the instrument to you. Kenny clarinet studio from China. Lyrique libertas, ridenour hw mp,legere euro cut reeds. I am chinese in China,there was too many instrument factory in China. 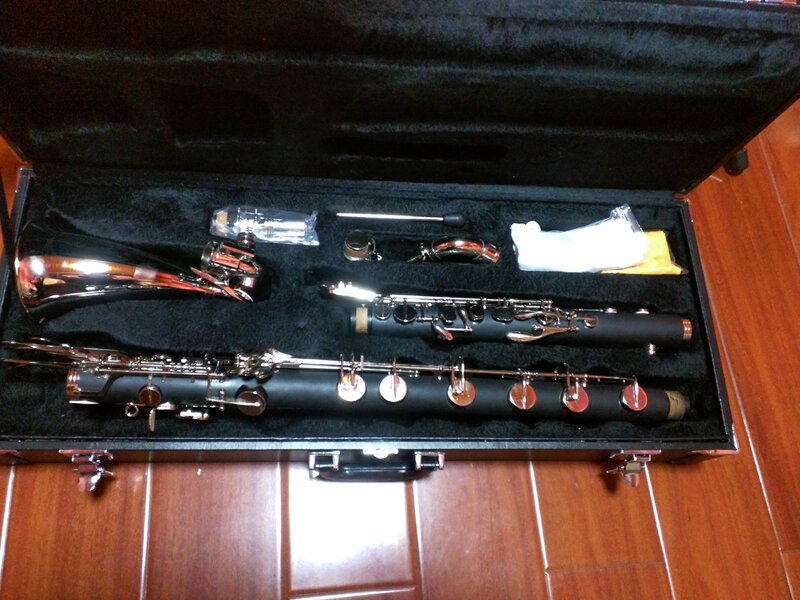 I also have a chinese made low C bass clarinet ,Keywork is very sturdy,selmer style side tril key, After I take out from case,it took me only a few adjustment and play great. I think it is same design like ridenours. any updates on this instrument? I might end up buying one, but ordering from China for such a sum might be a little dangerous. So far I can see mainly 2 different types of keywork - just check out the Kessler and Ridenour offering. We know Ridenour claims the keyword had been improved - xiao told me something similiar when I emailed him, the clarinet that he got get would even have this "twist" protection like a Ridenour. So I wonder wether any changes have been made to your "average" ebay or Gear4music bass. I'd have 0 problems making adjustments or even changing pads, corks etc. on my own, which I actually prefer as I can adjust the instrument to my liking if necessary. Personally, I'm really getting a hang of hard rubber instruments and so far the only Low C option is a chinese made one.